He feeds 4,000 youngsters nightly for more than a decade – some 2.8 million meals so far -- and has received acclaim the world over for his charitable work. But it is his most recent honor that tops all others. While on a world tour to promote his book, “The Power of Pasta,” Sir Bruno Serato was granted an audience with Holy Father Pope Francis and received a Papal blessing. Serato said that his Papal visit has been the highlight of his European book tour that included his being inducted into the House of Savoy. The book recalls Serato’s tale of growing up poor in rural Italy, arriving in America as a young man with just $200 in his pocket and through hard work, determination and a little luck, achieving the American dream when he parlayed his small savings into opening the Anaheim White House where he has fed U.S Presidents, royalty and celebrities. 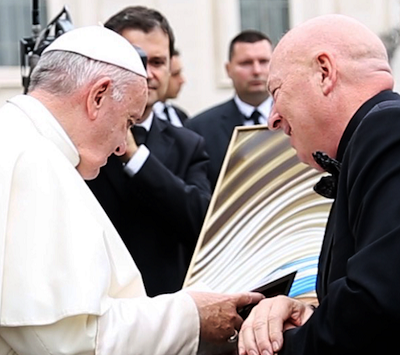 Serato informed the pope that all proceeds from the book will be donated to Caterina’s Club. “He smiled and gave me a blessing when I told him that,” Serato said.